Vo-tech or college is no longer an “or” question. With industries shedding traditional processes for automated, digital workflows, the demand for engineering and manufacturing technology education has skyrocketed. Vocational and technical programs have gone through a drastic transformation in the wake of a workforce becoming outdated seemingly overnight. Companies like General Electric and Dyson have created their own solutions to fill the gap, and even the Pentagon is mandated to support manufacturing training programs. But the movement is already afoot&ndash;schools and universities across the globe are investing in tech-rich spaces like fabrication (often abbreviated “fab”) labs, innovation centers, and makerspaces that expose students to new technology and, most importantly, equip them with the skill sets our modern workforce requires. 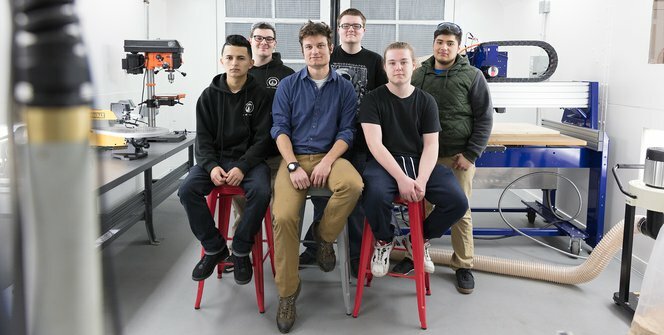 In Massachusetts, Somerville High School is redefining ‘vo-tech’ with its Career and Technical Education (CTE) program, preparing students for in-demand careers&ndash;whether through a path to college or directly into the workforce. Somerville’s CTE advanced manufacturing track holds court in the school's new fab lab, Fabville, which boasts advanced prototyping and production machines, from CNC milling to 3D printing. By night, the space holds classes for entrepreneurs growing their own businesses and (re)trainings for modern manufacturing jobs. We talked with Fabville director Jerry Shaw about the evolution of the CTE program, project-based learning and planning curriculum, and advice for educators creating and teaching in fab labs. At Somerville High School’s new fab lab, students learn to use advanced manufacturing equipment, from CNC mills to 3D printers. Formlabs’ Innovate & Educate Challenge invited educators across the country to develop and share lesson plans that encourage creative thinking and hands-on learning through 3D printing. Download Somerville High School’s lesson plan, one of the winners of the challenge, “Principles of 3D Modeling and 3D Printing” for free and visit our industry page for more lesson plans and resources. Why is it important to bring advanced engineering and manufacturing coursework into schools? One of the things that’s missing in a lot of high schools is that idea of actually thinking through a project from beginning to end. I used to teach a physics class and an engineering class at the same time. Students in the physics class would get bored with the labs, whereas in the engineering class, we’d be covering similar concepts and yet they’d love working on it. Later, I realized that it was the difference between labs and projects: labs have a prescriptive step-by-step process that you can’t deviate from, whereas with projects, the kids have their own creative input&ndash;something to hold on to that is theirs. Having that excitement around engineering and creating helps them better understand the creative process. Plus, 3D printers and laser engravers are things that many kids have never seen before. It’s easy for them to initially get excited, but then I show them a video of how they’re actually being used in industry; that you can actually 3D print prototypes, biomedical devices, organs, even food, and they’re hooked. Manufacturing today looks much different than it did 10 years ago. Schools and universities across the globe are teaching students to use modern technology and processes. Pictured here, Somervillle High School’s machine shop. Beyond that, a lot of traditional jobs have been lost to automated computer-based jobs. Part of the issue is that we don’t have people who know how to operate these newer machines; there’s a huge demand for those skills. Before we built Fabville, a lot of students were skilled in making things with the older equipment, but not in the new ways things are being manufactured, the digital fabrication side of using 3D modeling and CAD. That’s what’s being tied in now. Most of my current students have already been offered jobs. I have employers asking me all the time if I have anyone who knows how to run CNCs or digital 3D modeling systems. What’s different about Somerville’s CTE model, and how do you see it changing? Half of my students are going to college and half into the workforce. The stigma that used to exist around vocational programs has gone away, especially in Massachusetts. In the early 90s, the state put a giant emphasis on vo-tech education, to bring it up to high standards and implement more academic rigor. I went to college for engineering and was never on a vocational track. I didn’t know what an engineer was when I graduated high school because those opportunities weren't there. There are so many people in engineering or in design that don’t know how to work those machines or how to design. They know theoretically, but not physically. I think because that need to understand is at the forefront now a lot of kids aren’t seeing CTE programs as a barrier to college; 70 percent of our freshman class is enrolled in CTE. By their senior year, students enrolled in the advanced manufacturing track of Somerville High School’s CTE program know how to use all of the machines. All freshmen that enroll go through our exploratory program, where each student spends several weeks cycling through all of the CTE programs&ndash;from cosmetics to advanced manufacturing. In my shop some seniors help out with teaching the freshman, assisting them in using the 3D printers, etc. We show them specific projects, what the shop is, and what career paths they could choose. In the fourth quarter, freshmen choose three concentrations and are then placed into one program for rest of their four years. Another one of the nice things is that over that time the kids grow a closeness and a community with the teachers and fellow students. It’s like being a part of a club in school. There’s a lot of pride. There are a lot of buzzwords for schools bringing new technology into shared spaces&ndash;makerspaces, fab labs, innovation centers, etc. Is there a difference? There can be a difference between how schools use these kinds of spaces. Some are open ended and let students come in and work on what they want, while others find a structured way to introduce the machines and building things with them. The hardest part of a project can be to think up what you’re going to build or what problem you have to solve&ndash;a lot of times you need that structure in order to actually go through with building something. The biggest difference between in how we run Fabville and what some other schools do is that sense of structure. Like with 3D printing: A lot of places will buy a 3D printer and say “what do we do now?” Then they’ll just print things from online. That's not teaching, it’s printing out cool gadgets. Let’s talk more about that example. How does 3D printing specifically fit into your curriculum? 3D printing is faster in many cases, but is generally great for prototyping. We can take a 3D model, send it to the machine, and see how it’s going to be built in a more affordable fashion. When it’s exactly what we want, we then use stainless steel, which is a little more pricey, and take the time and build with that. I’ve also used 3D printing to teach 3D modeling&ndash;since 3D printing is fun and engaging it’s an incentive for students to learn CAD. Students learn to 3D model using SolidWorks or Inventor, but after a while that can get boring because you’re just on the computer, so we create their actual physical part using 3D printing. Then, students use measurement tools to double check and make sure everything printed correctly; learn the quality control aspects of it. At that point we’re getting into some of the manufacturing territory. Shaw uses 3D printing as a prototyping tool, and to teach valuable CAD and 3D modeling skills, finding that students are more engaged when they’re able to bring their designs to life. Beyond that, 3D printing is a basic tool to solve a lot of issues. So you teach how to use it in a structured way with 3D modeling, and then later on it’s a tool to use to solve any other problem, much like a saw would be. This helps students to understand how to use technology in context, then, later on if they have their own ideas, they can come back and work on those as well. All of my seniors know how to use all the equipment we have for the most part. In addition to regular curriculum, the way we use Fabville is that we’ll have jobs come in&ndash;here’s the problem, you’ve gotta solve it. For example, a knob to a steamer in the cosmetology shop broke and snapped off. One of my students went up there and measured everything out, designed a 3D model for the knob, and knew the knob had to be very precise in order to fit into the space in the machine, so he chose to print it with our Formlabs 3D printer. Learn more about how educators are using 3D printers in the classroom. Students in advanced manufacturing perform jobs for other school departments and CTE tracks, such as creating the placards pictured above for the culinary arts program. What do you see as some of the barriers for educators adopting new technology, and how do you find resources or inspiration? While I do have engineering experience, I don’t have experience in all engineering or all 3D printing. I didn’t know anything about 3D printing until a few years ago when it got kind of thrown at me. Also just having the curriculum ideas and the lessons to get started. A lot of people don’t have experience in designing or creating with these things, so having lesson plans out there that guide them in direction or help them know what’s important to look for can be a big help. Download Somerville High School’s lesson plan “Principles of 3D Modeling and 3D Printing” and sign up for our newsletter for updates as our lesson plan library grows. What other kinds of programs does Fabville support? How does the space fit into the community? Right now we’re in our first year, so we’re ramping up to get all of these programs set up. The idea is that people who don't necessarily feel comfortable creating things or working on machines, but want to learn how, can come here and gain that knowledge and background. People who are out of work can come here learn skills like 3D modeling that will help them get back into the workforce. Down here in the machine shop we actually have a collaboration with a local manufacturing consortium that’s putting people who have been laid off through machining classes, so they can get some of the jobs out there that employers really need filled. After school, Fabville and the machine shop host retraining programs in partnership with a local manufacturing consortium. As far as Somerville itself, hopefully the goal down the line is that more and more people looking to create their own businesses, even some of our students with entrepreneurial ideas, can get started here. Our role is not to augment or replace what other community fabrication centers or makerspaces are doing, but to create a launch pad for people who aren’t necessarily as comfortable going to a space where there are a lot of people working; it’s a safe environment to slowly get to know how to use the machines, then step up to another space or go straight to creating a business. What’s up next for Fabville? One of the greatest aspects of the future is our new high school that just got approved. In the new setup, the machine shop and fab lab will be next to each other, we’ll have a few machines that will make things easier, such as electronic textiles, and all of the CTE departments will also be interspersed throughout the high school itself. We’ll be also be looking to implement some robotics and mechatronics programming, and starting to teach students how to design robots and implement them into manufacturing processes. Thanks to those who submitted to Formlabs’ Innovate & Educate Challenge, we’re able to share free resources with a wider learning community dedicated to inspiring students with rich, immersive experiences. Download our first two lesson plans, the winners of the challenge, to learn how to effectively integrate 3D printing into your curricula. Curious about 3D printing and the possibilities of a Formlabs 3D printer? [Request a free sample part](/request-sample-part/).